Armenia’s new partnership agreement with the European Union will take effect this spring, but don’t expect it to trigger tensions with its ally Russia. Throughout the past decade, Armenia has pursued a delicate balancing act, aiming to deepen ties with the European Union (EU) while maintaining a strategic alliance with Russia. Armenia’s signing of the Comprehensive and Enhanced Partnership Agreement (CEPA) with the EU signals its shift toward Europe amid growing tensions between Russia and the West. Due to take effect in April, the agreement does not threaten Armenia’s historically significant alignment with Russia, says Benyamin Poghosyan, director of the Political Science Association of Armenia, a nongovernmental organization based in Yerevan. What is Armenia’s relationship with the European Union? The EU plays an important role in Armenia for fostering reforms in different spheres, mainly political reforms to boost good governance and transparency. These include judicial reforms, to support Armenian efforts to make the judiciary more independent, and also economic reforms, especially creating a more competitive atmosphere for investors. The European Union is also supporting different spheres of the Armenian economy: agriculture, renewable energy, small and medium enterprises. In November 2017, the Comprehensive and Enhanced Partnership Agreement [PDF], which was signed between Armenia and the EU during the Brussels Eastern Partnership summit, will help to further Armenia-EU relations. What are the most important provisions in CEPA? State modernization in different spheres, but mainly political and economic. Armenia undertook several obligations to modernize the state, have a more free political system, have a more free economic system, increase competitiveness, and fight corruption. The EU is ready to support Armenia through both technical and financial support. More important for every Armenian citizen is the fact that this agreement is paving the way for negotiations on a visa-liberalization scheme with the EU. This is one of the carrots by which Armenian society will support the reforms envisaged in the agreement. What are some of the programs that CEPA will fund? The EU-Armenia Single Support Framework identified three main areas for EU support from 2018 to 2020: private-sector development, public administration reform, and justice-sector reform. The EU allocated approximately 160 million euros, with 35 percent to private-sector development, 25 percent to public administration reform, and 20 percent to justice-sector reform. The remaining 20 percent has been allocated to capacity development and institution building, as well as to civil society organizations. Negotiations are underway to identify concrete projects, which will be finalized after provisional application of CEPA. The Armenian parliament envisages ratifying the agreement in mid-April, which will pave the way for provisional application. 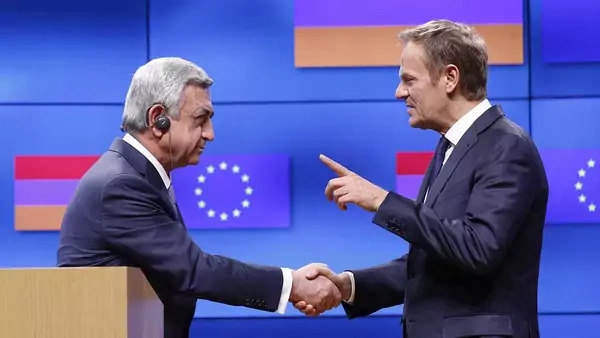 In 2013, Armenian President Serzh Sargsyan unexpectedly withdrew from an association agreement with the EU and entered the Russia-led Eurasian Economic Union (EEU). Why? Starting in 1991, Armenia chose a strategic alliance with Russia that included having a Russian military base in Armenia and several Russian state or state-affiliated companies controlling large portions of the economy. When in 2010 Armenia launched its negotiations with the EU to style an association agreement, the security environment around Armenia was far different than in 2013. In 2010, it was the middle of the U.S.-Russia reset, launched by the Obama administration. In this period, relations between Russia and the West were much better, and for Armenia it was much easier to start its association with the European Union. Unfortunately for Armenia, the situation started to change in September 2011, when Vladimir Putin announced his decision to run for a third presidential term. This decision, and the December 2011 Russian Duma elections, after which we saw large protests in big Russian cities, were the first signs of deterioration in Russia-West relations. The West started to see Russia as moving toward a more authoritarian government. This atmosphere did not bode well for Armenia-EU relations. Another factor influencing Armenia’s decision [to withdraw from the association agreement] was the idea put forward by Vladimir Putin to form the Eurasian Economic Union. This idea was first presented in October 2011 by then–Prime Minister Putin, and it was a major foreign policy goal for his third presidential term, starting in 2012. Taking all this into consideration, Armenia made a decision not to go on with signing an association agreement with the EU but rather to join the Eurasian Economic Union. What impact will CEPA have on Armenia’s relations with Russia? This agreement is not likely to change the geopolitical balance in the South Caucasus or to change Armenia’s foreign policy, because nothing written in CEPA contradicts Armenian obligations to the Eurasian Economic Union. My understanding is that Russia has the confidence that any agreement with EU, including this one, cannot threaten its position in Armenia. Balanced foreign policy does not mean equal relations with all partners. Does CEPA represent a westward shift in Armenia’s foreign policy? It does not represent a westward shift in Armenia’s foreign policy. Since 1991, Armenia has tried to have a balanced foreign policy. But balanced foreign policy does not mean equal relations with all partners. Since 1991, the main partner and the sole strategic ally of Armenia has been Russia. There are different reasons for the alliance, starting with historical ones. In the mid-nineteenth century, Russia was perceived in Armenia as a savior, having saved it from attack by the Persian Empire. During Soviet times, there was huge propaganda in Armenia [saying that] if not for Russia, Armenia simply would not exist. Also, there is pro-Russian sentiment because since 1991 Armenia has been under Azerbaijani aggression and a Turkish blockade. Armenia had to face joint Azerbaijan-Turkey pressure, and under these circumstances Armenia has no choice but to firmly anchor itself with Russia. So yes, Armenia tried to have a balanced foreign policy, but its main strategic ally was Russia; it’s still Russia, and I believe that in the foreseeable future, it will be Russia. In its contacts with other power centers—the EU, NATO, and the United States— Armenia will try to develop its relations, but there are red lines that it is not ready to cross. What are those red lines? Russia believes that former Soviet states should be under its control and serve as a buffer zone against perceived Western pressure. So, Armenia is in a difficult situation, because it cannot systematically or radically shift its foreign policy, and needs to continue its strategic alliance with Russia. However, it needs channels open with the West to modernize itself, which is vital to Armenia’s long-term national security interests. Russia believes that former Soviet states should be under its control. During his last state of the union address, Russian President Putin made a very harsh assessment of Russia-U.S. and overall Russia-European Community relations. These conditions will make it more difficult for Armenia to continue to be a strategic ally of Russia, and remain within the Russian sphere of influence, while simultaneously trying to get Western assistance to modernize. This will be the key challenge for Armenia, at least in the coming six years, for the Russian president’s fourth presidential term. I believe that Russia will be more assertive in former Soviet states to institutionalize its control there, which will negatively affect Armenian efforts to develop its relations with the Euro-Atlantic community. How does the United States view the agreement? In general, it will have a positive impact on U.S.-Armenia relations. Since the collapse of the Soviet Union, the main policy of the United States has been to support post-Soviet states to develop independent institutions and be integrated into the international arena. This policy has two main reasons. First, the U.S. believes that as countries are institutionally developed and democratized, they are less likely to enter into war with each other and more likely to have friendly relations with the United States. Second, the United States understands that if post-Soviet states are not modern states—if they have internal difficulties and weak institutions, if they lack good governance, if there is corruption—it will be much easier for Russia to impose its influence on them.